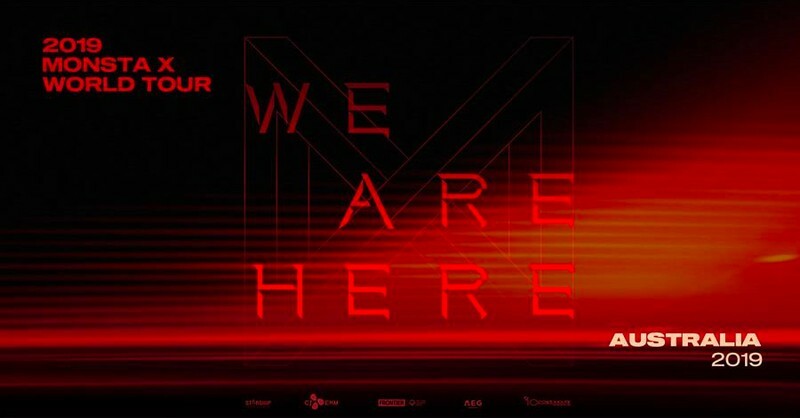 Touching down in 18 cities and 12 countries across Asia, North America, Europe, Australia, and South America, the 'We Are Here World Tour' the band's biggest tour to date, celebrating the release of their two most recent albums 'Take. 1 Are You There?' and 'Take. 2 We Are Here', featuring hit singles 'Alligator' and Steve Aoki collaboration 'Play It Cool’. Monsta X fans, aka ‘Monbebes’, can attest to the fact that the boyband’s live shows are matchless—brimming with intense vocal performances, punchy choreography, and unrivalled stage presence. Each of the seven band members brings another layer of energy, power, and excitement to the stage. After coming together to form Monsta X on reality show No.Mercy in 2015, members Shownu, Wonho, Minhyuk, Kihyun, Hyungwon, Joohoney and I.M debuted with their 'Trespass' EP (2015) which peaked at #5 on the Korean charts, followed by 'Rush' EP which peaked at #3. Since then, the band have consistently released albums, songs, collaborations, mixtapes, soundtracks and cover songs, with their first studio album 'The Clan Pt. 2.5' hitting #1 on Billboard’s World Albums chart. 2018 was a huge year for the band, with their 'Take.1 Are You There?' album, featuring 'Shoot Out', landing on multiple Billboard Charts. They were also selected to perform at iHeartRadio’s annual Jingle Ball event, and performed six concerts across the United States, making them the first ever K-pop group to do so. They backed it up quickly with 'Take.2 We Are Here' in February, which included hit single 'Alligator' and the Steve Aoki collaboration 'Play It Cool'. The album debuted at #1 on the iTunes album chart across the globe, with 'Alligator' collecting 10 million views on YouTube in less than three days upon release. Monsta X embarked on successful world tours in 2017 and 2018, including several sold-out performances, but this upcoming world tour includes their first ever shows in Australia. Monsta X’s global tour has been arranged by CJ Entertainment, AEG Presents and Powerhouse. Known for their charm, energy, and infectious live shows, they are not to be missed.